I was recently introduced to Bill Bryson’s adventure on the Appalachian trail. I was at home one Sunday afternoon when a trailer for the newly adapted movie with Robert Redford and Nick Nolte came on the TV. I was immediately interested in this story and so I bought the book and began reading. A Walk in the Woods is the story of Bill Bryson and his friend Stephen Katz’s attempt to hike the Appalachian Trail back in 1998. 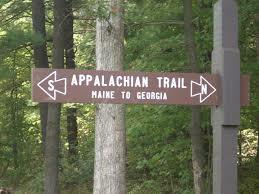 The Appalachian Trail is a hiking trail that runs across the Eastern Seaboard in the U.S. It goes from Springer Mountain in Georgia to Mount Katahdin in Maine. It was founded by two Americans, MacKaye and Avery in the 1920’s. In spite of a fractious relationship between these two men the trail has not only survived all these years, it has thrived. It is approximately 2,200 miles long, although this number fluctuates a little bit every few years as the trail gets modified or rerouted. The A.T. as it is often called, is the oldest of the many hiking trails in America. Others such as the Pacific Crest Trail (PCT) have surpassed it in length over the years but it still remains the most celebrated. It is managed by the National Park Service, United States Forest Service and the Appalachian Trail Conservancy who are a non-profit organisation. It is said to be the largest volunteer run under taking on the planet. As a result it is completely free from commercialism. Every year around 2000 people start off from Springer Mountain intending to hike all the way to Maine. These are called through hikers but less than 10% of them make it all the way. Bryson just happens upon the trail one afternoon shortly after his family moved to New Hampshire. He noticed a footpath that wandered into the woods and discovered it was part of the A.T. After this chance encounter the idea of hiking the trail began to percolate and Bryson couldn’t get it out of his head. It was as though the trail was inviting him on a great adventure. He decided to accept this invitation and thus began the journey. In the coming months Bryson begins to formulate the trip in his mind. He collects every book he can find on the A.T. including an endless amount of hiking equipment. He also starts talking to anyone he can find who has hiked the trail or anything like it in the past. The more informed he becomes the more he realises that this is going to be much harder than he had first imagined. There were you see, as he had now concluded from his research, many things to be afraid of out in the woods. There were wild animals, dangerous weather conditions, not to mention the various diseases one could contract in the outdoors. Bryson describes in detail the many ways he could meet his death out on the trail. The one that he becomes the most fixated on is bears. He purchases books that describe, in very colourful detail I might add the number of ways that bears can kill, eat and dismember someone if they were to encounter them along the way. These stories don’t leave much to the imagination I can promise you that. Nevertheless Bryson still has a strong desire to go on the hike. I have read many books about people who go on these types of journey’s over the years. For whatever reason and in spite of fear they seem to be compelled to go. I have always enjoyed these tales of unexpected adventure. I loved for example Wild by Cheryl Strayed. There is however something different about this book. Perhaps it is the male perspective that brings about this particular approach. There is no obvious reason why Bryson is going on this trip. He has a good family life, he enjoys his career and it’s not a religious or spiritual calling either. He is not escaping disaster or recovering from tragedy. 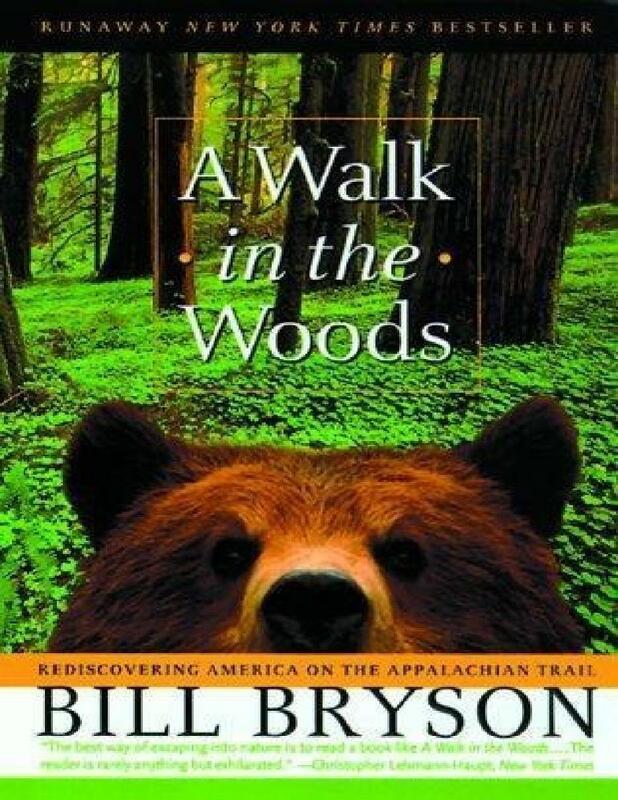 In fact if you were to ask Bill Bryson why he took this hike he would simply say that he wanted to go for a walk in the woods. He ream’s off a number of rationalizations in the opening chapter of the book in order to justify this crazy notion, these include loosing weight and the fear that these beautiful surroundings might not always be there to appreciate. The facts about global warming in this book are frightening and it was written nearly twenty years ago. I dread to think what the situation is now. Although these are all respectable reasons I suspect that in the beginning Bryson doesn’t really know why, he just wants to go. Although Bryson was determined to do the trail he wasn’t very keen on doing it alone. The Christmas before he was due to depart he sent out cards inviting anyone who was willing to go with him. A long time passed and no one had responded. Finally in late February Bryson received a call from his old school friend Stephen Katz. Some readers will remember Katz from Bryson’s book Neither Here Nor There where he describes a trip to Europe they took together in their youth. Stephen was calling to say that he would like to go on the hike if Bryson would have him. Of course he was delighted but at this point he would have gone with just about anyone who offered. The two men had grown up together but hadn’t seen each other in years. Their paths just hadn’t crossed as they were both leading very different lives. Katz was a recovering alcoholic and drug addict who still lived in their home town in Iowa. Bryson was a writer who had moved away to England for many years, met his wife, got married and had children. Nonetheless they both agreed that Katz would fly to New Hampshire the following week and a few days later they would begin their adventure. From the first moment Katz arrives readers learn that this is going to be a very interesting ride. From here our two unlikely heroes trudge off towards the summit at Springer Mountain. On the first day out Katz is really struggling and Bryson, although he is somewhat better equipped is also finding it very hard. There are long periods of time where Katz falls behind and his safety is only known by the sound of his bitching and cursing in the distance. On one particular occasion, after loosing sight of him for some time Bryson discovers that Katz has thrown many items from his pack over a cliff in a fit of rage. Bryson now has to carry both and put up Katz’s tent as well as his own. They are if you excuse the pun, off to a rocky start. Bryson goes on to describe their big adventure out in the woods with great wit and dry humour. Much of the comedy comes from the fact that these two middle aged men are defiantly ill prepared for what the wilderness has in store for them. I know a woman who gets in her car to go a quarter of a mile to a college gymnasium to walk on a treadmill, then complains passionately about the difficulty of finding a parking space. When I asked her once why she didn’t walk to the gym and do five minutes less on the treadmill, she looked at me as if I were being willfully provocative. ‘Because I have a program for the treadmill,’ she explained. After weeks of being out on the trail and walking millions of steps the two men finally come to the realisation that they are never going to complete the entire trail. They have to face the fact that it is not possible. They must acknowledge the difficult truth that they are not twenty-one any more and they are not mountain men. I was struck by this revolution because in so many stories the moral seems to be don’t give up, you can do it, carry on regardless but this was different. Of course they both felt a sense of disappointment upon knowing it was time to go home but it didn’t feel like they were giving up. It was as if they were coming to terms with their limitations. Very often we equate these moments in life with failure. We berate ourselves for not being able to do more rather than looking at what we have done. Bryson and Katz did something that most of us will never do. They saw beautiful sights that most of us can only imagine. When Bryson finally tallies up the miles it turns out he covered a mere 39.5% of the trail. At first he feels completely deflated by this but it works out at 870 miles in total, a huge accomplishment I think you will agree. I have certainly never done anything quite as impressive and yet he felt like a failure. This shocked me and yet I understood the feeling. There has been many occasions where I didn’t attempt something because I was afraid that I wouldn’t be able to finish it but look at what Bryson and Katz would have missed if they hadn’t tried. Personally I am so glad they did because I throughly enjoyed going for a walk in the woods with these two characters. On the last day of their journey Katz blithely says “we did it, we hiked Maine” and Bryson gives him a confused look telling him that this was nonsense, they didn’t even see Mount Katahdin for God sake. Katz who is not known for imparting wisdom, dismisses this immediately as just a minor detail. He insists that he hiked the trail in snow and in heat, in the North and in the South until his feet bleed. No matter what anyone says he knows he hiked the Appalachian trail. I was very touched by this declaration. Instead of focusing on an arbitrary number that means nothing and says nothing about their experience they both begin to see it from another perspective. No matter how much ground they did or didn’t cover they accomplished a great deal. The trail gave them an appreciation for nature, patience, resilience, gratitude and most importantly a renewed friendship. Perhaps we all should remember that the effort is never wasted even if we don’t do exactly what we set out to do. Trying in itself is a noble act. They didn’t walk 2,200 miles but for Bryson and Katz the beauty was in the attempt. This entry was posted in Uncategorized and tagged A Walk in the Woods, Appalachian Trail, Appalachian Trail Conservancy, Bear, Bill Bryson, Cheryl Strayed Wild, Georgia, Heroes Journey, Hiking, Joseph Campbell, Katz, Maine, Mount Katahdin, Nick Nolte, Pacific Crest Trail, Robert Redford, Springer Mountain, Virginia, Wildlife Conservation. Bookmark the permalink. Perhaps it is time for me to revisit this book. I read it when it first came out (haven’t seen the film yet) and it quite honestly kind of annoyed me. Not the idea or the writing or anything like that, but frankly when Bryson went through such painstaking preparation for the trip and then was left with Katz I felt almost as if as a writer he had wanted it that way, and I felt let down. A comic foil and sparring partner makes for a far better book than two people setting reasonable goals, with proper equipment in it for the adventure. I felt let down that Bryson accepted Katz quite honestly and it spoiled the book for me. Reading this thorough review right now I think my attitude about it may have been wrong. Of course even their partial trip should be viewed as an accomplishment as you say and viewing it in that way I think I might re-read the book. Great review! Thanks Robert I see what you mean but I think it was more that no one else would do it with him lol. I really appreciate your comment and hope you give the book another go. I kept the book on my shelf for all these years despite my experience, maybe hoping for a reason to pick it up again. This could be the chance lol. Part of it was also that I generally shy away from anything that is popular and that everybody is reading/watching/listening to at the moment and I’m pretty sure that with this one I read it in the middle of the hysteria which may not have helped. I had look at your blog and it was very helpful thank you Janice and thanks for the visit. I have been enjoying your posts as I try to improve at blogging so just wanted to say thanks. Love your description Of these two men Laur inspiring me to go to see the film!! Just dropped in from the “Community Pool” and was completely drawn into your writing. I’m going to have to see about getting the book for my husband to read to my son & I. I see a new hiking adventure in our future (not the whole thing). Thank you Brie and thank you for visiting. I recommend the book its a great read and if you do have a hiking adventure don’t forget to come back and tell me about it! This is John Cahill. I read the blog with huge interest its wonderful. I loved your take on it as I didnt get that from the movie and now I, love the movie more , having being enlightened by an old friend. Its a lovely movie. I must get Wild too now and watch it. JoAnn and I did a lot of hiking in Ireland when I was trying to get fit for a medical exam for emigration. We loved it, then got here and got lazy. We did hike across the AT trail at its mid point, I have a pic lol. but we literally walked 6 foot across the pathway, maybe not even that lol. We cheated, like we did on the Camino, There we got train from Madrid to Santiago and taxi to a mile outside town where trail enters town then ‘hiked’ the last mile with the pilgrims, I even got a stick with a shell etc. Again a great cheat but a fun thing to do. Oddly enough, the same train we were on crashed exactly a week later killed 80 people I believe. I knew the driver was going too fast even on our trip. Turns out he was on Facebook trying to beat his own speed record, hes in jail now for ever I hope. And thats my reply to your great blog. Thanks for posting it I loved it. Keep well my friend.